22, stationed at Marine Corps Air Station Yuma, where he was a Harrier jet mechanic with Marine Logistics Squadron 13 of Standish, Maine was found dead on March 21, 2011. Here is a family picture of Josh with his sister, Sarah Yeo of Standish. 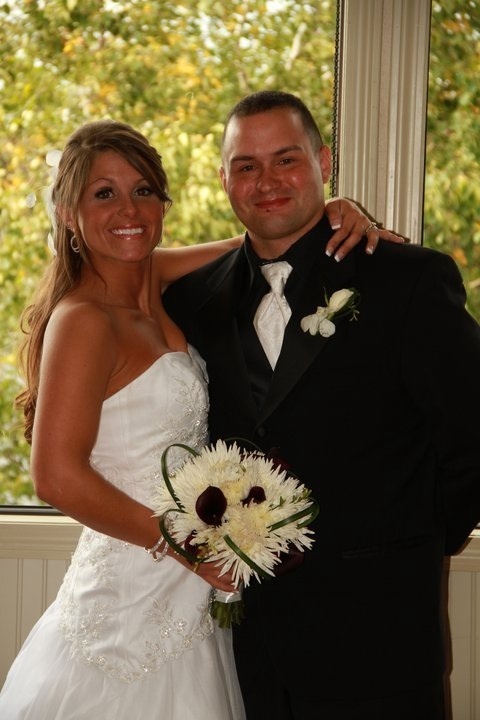 Joshua grew up in Standish and graduated from Bonny Eagle High School in 2007. He excelled in football and wrestling. He also learned karate. Throughout school, he always had his sights set on joining the Marines. To honor his son, Mr. Dean Barron unearthed this memorial stone from Watchic Pond in Standish, Maine. He gave it to TSP over Veteran’s Day weekend 2014. Josh loved Watchic Pond. He grew up there since childhood and lived in a colonial house along the lake. Dean Barron described the his son’s character as one of protector and guardian. He would set traps to catch imaginary dragons, demons and other threats to his friends and family. he was a martial artist and ready to defend the weak and protect the innocent. He was also a jokester though. He liked to play fun pranks on his sister but only out of love and good humor. He was always full of energy and he always has an upbeat attitude. Dean said that his son had a very positive experience in Marine Corps bootcamp. Josh was grateful to the USMC Captain who helped him improve his pull-up performance so he could succeed in basic training. Josh loved the US Marines. He made lasting friends, learned discipline and teamwork and esprit de corps. He appreciated and treasured the sense of belonging and family. He valued the camaraderie above almost anything else. Josh’s goal was to get a Bachelor’s Degree in Computer Science. He loved working with computers and his ultimate goal was to work for the CIA and help solve problems by knowing how to find answers to tough puzzles. Josh’s dad said he was a great Marine, caring, helpful and kind to others. Always willing to help and ready to be the first to volunteer for the tough job. Finally, it must be noted that Josh’s dad, Dean, has been extremely helpful and supportive to organizations in Maine that honor our fallen heroes. Dean stated “I am trying to tear a page from my son’s book” and help others when they need it. He wants to ensure Josh’s memory stays alive and Dean has done just that. He is a board member for the RFTF and has hiked with TSP already. He stepped up, just like Josh would have done, when leadership was needed. Thank you Dean. Thank you Josh for your inspiring example. Maine Heroes are NOT Forgotten. Josh was a true friend and mentor to me. He will forever live on the the hearts and minds of me and my family. Before the hike: I’m ashamed to say that up until a month or so ago, I had never heard of The Summit Project. Two of my kids at Highview Christian Academy saw a flyer at school and heard Chad Januskiewicz talking about it. I went to the informational meeting because I like to snowshoe and the project sounded interesting. I got the information at the meeting, and I was ready to choose a stone. Well, I wasn’t prepared for the website. I thought it would be easy to choose……was I ever wrong about that! I don’t know how long I spent watching/listening to videos and reading the stories of these soldiers. I completely lost track of time, and decided I needed to come back to the website another day. The next day I tried again with the same results – I could not choose. I felt torn between choosing someone whose story I had heard or choosing someone who had no story on the website. I finally asked Chad to pick someone for me. Chad chose Josh for me, and when I heard his story I immediately felt that instead of me picking a stone, the stone had picked me. I have a son who has always wanted to be a soldier and recently enlisted in the Marine Corp at age 17, just like Josh. My son’s middle name is Joshua. The similarities were striking. During the hike: The hike was harder than I expected. I have climbed Borestone numerous times in the summer and fall, but never in the winter and never with snowshoes. I was going along fine until we got near the summit and the rock face. The rocks were covered with ice and then a few inches of snow on top of the ice. Ted Coffin and Chad hooked up a rope for us to use to get up over the really steep, icy, rock face. It took some encouraging from Ted and from our Bangor Daily News photographer Ashley to help me along. After another spot where we needed to use the rope to get up and over we were very close to the summit. I was very nervous of the ice combined with the height and had thoughts of not continuing. A bit more encouragement from Ted and up I went. Getting to the top was a bit of a mental challenge for me, but I had that stone in my backpack that I kept thinking about and telling myself that I couldn’t let that soldier down. Once at the top we took a few minutes to enjoy the view and take some pictures and then we got down to the business of why we were all there at the top of that mountain during a Maine winter. We gathered in a circle holding our stones and shared the stories of these men one at a time. It was humbling, emotional and awesome all at the same time. It was inspiring to hear why each one there chose that particular stone. After the hike: It’s only been a few days since the hike, but I can’t stop thinking about it. I didn’t expect it would have that great of an impact on me, but I’m glad it has. There are few things that come into our lives that leave lasting impressions or cause changes in us and this is one of them for me. The feeling I have this week is similar to the feeling I had after returning from a missions trip to Haiti. I am grateful for my life here in the U.S. and I have even more respect for the men and women who serve this country. I am thankful for the camaraderie of the team that I hiked with – some of us meeting for the first time that morning. I have great respect for the work of The Summit Project and all those who volunteer their time with this project. What was meant to be a blessing to someone else (the family of Joshua Barron) ended up being more of a blessing to me. Hello my name is Angelo Fascione and i was honored to carry the stone of CPL Joshua Barron. From what i learned about him he was a good guy and loved his family very much. We climbed the to the summit of Mt.Bigelow. The Hike was very good and the group had a great time doing it. The trail was kept very nice,but it was still a challenge to do. We also could not ask for a better day weather wise to do the hike! When i was Hiking i really wanted to stop, but i knew when i was thinking about him and what he sacrificed for our freedom. All 24 cadets of Nokomis J.R.O.T.C were honored to do this and we would gladly be doing it again next year. Thank you for making The Summit Project and all it stands for and letting us be apart of it! Your son meant the world to you, and he was meant to still be in this world. Time does not heal all, nor should it diminish the love we feel for someone. In fact, sharing his story and carrying on his legacy will reinforce the impact that his short life had. When someone of Joshua’s character leaves us too soon, it’s the things that he would have done that we need to continue. Everything that you’ve shared with me about Joshua makes me wish I had gotten to know him in life. The best I can do is to stand for the things that matter and give more than I get. To protect those in my life and put care into everything I do. I had the privilege of carrying Joshua’s memorial stone to the summit of The Owl with TSP at BSP on May 24th, 2015. I would gladly carry him anywhere. Steps of the hike were alternated with tears and laughter of the stories that you’ve told and the thought of his loss. Not only on this hike, but on the training before the hike, thinking of what I was preparing to do, both physically and mentally. Though the hike was tough, the thoughts of our fallen and the memories that we are preserving kept me going. My teammates were exceptional as we supported each other on our journey. The stories at the summit were extremely emotional. Siblings, comrades, parents, both military and civilians were all there to keep the stories alive. I don’t remember them all, but the impact they had on me will affect me for the rest of my life. I will carry Joshua every day for the rest of my life, with or without a stone to remind me. I hope in some way I can help you heal and help you carry on Joshua’s mission. Anything you need, anytime, just ask and I’ll do my best to be there for you and your family. Since hiking with you at the ANP event and getting to know you, I consider you a good friend. I hope this continues into the future and we can share more stories of Joshua. I have much more to learn, whenever you have the time. After hiking with Joshua Barron’s memorial stone on Memorial Day weekend with TSP, I had the idea to hike with him to the highest point in Maine. I asked Dean if I could hike with his son to the summit of Katahdin. He said I didn’t need to ask, but he was grateful that I did. For my birthday, July 12th, I hiked Katahdin to Baxter Peak with Joshua Barron’s TSP memorial stone and a stone that my wife made for a memorial for her father, Bernie Gerry. While both men served in the Marines, Bernie got to life a long life, but Joshua’s was cut short at the young age of 22. My hike was through Chimney Pond and The Saddle to Baxter Peak. There was a nice cool breeze most of the day, which made for a very enjoyable hike. At the summit, many people were there waiting for Scott Jurek , a long distance runner about to break the Appalachian Trail record. I took Joshua’s stone out of my pack and it instantly started people asking questions. I told them about Joshua, how he was both a protector and a prankster, and how he had always wanted to be a Marine. How high school sports helped keep him out of trouble, and his love of his family. After that, I pulled out Bernie’s stone and told them how he had died 5 years ago on that very day. How he was one of the best men that ever lived, and that he spent a lot of time in his youth climbing the mountain. His mother wouldn’t let him go to East Millinocket, because there were girls, but she would let him hike the mountain on this own. He even skied up to Chimney Pond at least once. And then, I pulled the trifecta out of my hat and told everyone that it was my birthday! I told them I had no issue spending my birthday honoring others and it was a privilege to do it. Thank you Mike for both of your hikes with Joshua’s stone. I know that you learned more about him then most have at TSP. Please keep his memory with you throughout your life. God Bless You! On Aug 7th 2015 TSP came to my home town Lincoln,Me. I have to be honest, I did not know much about TSP. I had seen a few things on the news about it but that was it until my friends Justin and Jessica Cloukey told me about a hike they were doing with TSP up Cadillac Mt. They told me what the hike was all about and how it went, and I could tell by the way they were talking about it that it was something special. So when I find out TSP was coming to Lincoln I asked to be involved. I was chosen to carry Marine Corporal Joshua Barron’s stone. Justin told me he had hiked Cadillac Mt. with you Dean and made quite a connection with you on that day. Right then I felt honored to be carrying Joshua’s stone. Dean I want you to know you would have been very proud of the town and the people who participated in this march. I know I was as I carried your sons stone through the town I grew up in. People were standing on the side of the road waving there flags, businesses had signs welcoming TSP, workers from those businesses were standing outside with there hands over there hearts as we walked by. I even saw a few tears shed. Your son was honored that day along with many others. Maine Hero’s Are Not Forgotten! Participating in this march really opened my eyes and heart. Seeing everyone that day carrying stones, hugging each other, telling stories, comforting each other was amazing. I’m glad I had the chance to be a part of it all because it woke me up. We tend to get caught up in our own lives we forget there are men and woman risking there lives for our freedom . There are familys loosing there loved ones for our freedom. Your son was an amazing young Marine who left us to soon. I will always keep this march along with Joshua in my heart and mind. I would be honored to keep his memory alive. I had the privilege of hiking with Joshua’s stone on 17 October 2015. As a member of Team Tarn, we hiked up Dorr Mountain then across to Cadillac Mountain. The views were incredible and the weather changed often but cooperated. I did interact with several of the hikers on my team but this was a somber hike for me. Like all of the fallen, I can find similarities between their lives and mine. Not only could I relate to Joshua in regards to aviation but also in his desire to be full of energy, have an upbeat attitude and wanting to help others solve problems. As we go through this journey that we call life, we sometimes go through changes or get so busy that we either suppress these traits or we forget what is truly important. I am truly sorry for your loss. I hope that you find some reassurance that your son is making a positive impact on others through The Summit Project. Josh’s father, Dean is very active in organizations that honor the fallen heroes of Maine. In his own words “I am trying to tear a page from my son’s book.” I hope that we all learn from both of their examples and do the same. Your son meant everything to you, your bundle of joy, the smile on your face, the reason your day was always bright and happy. They say we heal in time, but being there for someone for a long time can have such an impact on us without even knowing. We know deep down in our hearts that we won’t heal. However, Josh wouldn’t want his amazing family and sibling to be grieving forever. Josh knew the risks of going into the Marines, he was risking his life to protect millions of lives. Josh wanted to be a hero, he was a hero and he still is an hero. Before the hike, I thought it was going to be boring, climbing Bradbury mountain didn’t sound appealing to me. I didn’t know what we’d be doing, I thought we only had to climb the mountain with the soldiers rocks. During the hike, I thought about how many people went into the service risking their lives to protect their country. While I was walking, I thought about how many times we loose our loved ones. I realized that the sacrifices that these soldiers and Josh make every living day, is astonishing. I didn’t feel selfish about me living my life, I felt sorrow, hurt, and broken. Knowing a loved one had passed away or k.i.a (Killed in Action). Josh and many soldiers sacrificed their lives to serve our country. They didn’t want to go into the service because they wanted the title “Soldier”. They wanted to be remembered for why they went in. Josh’s, Dustin’s, Tyler’s, Matthew’s contribution to serve our country is beyond astonishing. After the hike, I finally realized that all the Marines, Navy, Air Force, and army wanted to be there for our country, and their people. The more I got to think about him, I wished that Josh could’ve had a longer life span. I had the privilege of carrying Joshua’s rock to the summent of Bradbury. I’m glad that Josh served our country but sad that he had to be taken at a such young age. I’m so sorry for your loss, Josh sounds like a great son. I am very honored to have been able to hike Joshua’s stone up Mt. Bradbury on December 4, 2015. It was a very touching expirience for me because I have many relatives that are veterans or are still fighting in the war. Also I have a brother who is much younger than me and the thought of losing him to war is devistating. The hike up the mountain was pretty difficult for me but on my way up I was just thinking about Joshua and what he had gone through in the war which made me rethink the whole hike. I can relate to Joshua because me and him both act as guardians to the people we love. I will never forget about my expirience hiking with The Summit project. It definitely helped me really understand how I don’t have it as bad off as some people. The war really affects a lot of people and their family’s. I thank you for participating in this project and allowing us to get to connect with your son. I am so sorry for your loss. Thank you for the dedication to the Summit Project and your support to organizations in Maine that honor our fallen heroes. By being so dedicated to these organizations, it has given me the chance to carry Joshua’s stone to the top of Bradbury Mountain. Hiking up the mountain, I started thinking about what soldiers have to go through every day and I realized hiking a mountain, which seemed tough, wasn’t nearly as tough and tiresome. It was my first time hiking and I knew I couldn’t complain about how muddy it was or how wet it was or how out of breath I was by the time I got to the summit because I knew that Joshua and all the other soldiers went through things that were ten times worse. I was proud to carry up a stone in honor of someone that had so much dedication and bravery. His story taught me how to be strong and go out of my comfort zone to do big and powerful things. His story has inspired me to accomplish goals I set because I have the chance. It has inspired me to treats others with respect, do things for others, appreciate what I have and every morning I wake up. So, I would like to thank your family for your bravery, respect, courage, dedication, time and the opportunity to honor Joshua’s life. It means a lot to me. I had the honor of carrying Cpl Joshua P. Barron’s up to the summit of Bradbury mountain. Joshua was 22 when he passed away. He was found in an irrigation canal in Yuma, Arizona, with a gunshot wound to the head. Joshua’s parents always described him as the protect or guardian of the family. He was always setting traps to catch imaginary dragons and demons that were a “threat” to his family. Throughout his life Joshua always wanted to join the Marines. That shows from a young age that Joshua wanted to help people, that he wanted to put the lives of others before his own. That takes bravery and courage to make that sacrifice. Joshua loved the Marines, but what he loved the most was the camaraderie amoungst everyone. While I was climbing the mountain, all I could think about was how tired I was and how much I just wanted to take a break. But then I realized how tired he must have been. All I had to do was walk to the top of Bradbury mountain. I don’t know what being in the Marines implies, but I know that it would take so much more work the climbing that mountain. The work, effort, and time that he put into the Marines was so much more than what we put into climbing the mountain. It made me appreciate what he did a whole lot more. I personally know what it’s like to have family in the service. Both my uncle and cousin are in the service and it’s hard having them gone for long periods of time. I could never imagine not having them come back, that would be the worst thing of all. I hope that the family has found the closure that they need, and I hope that they know that carrying their son’s rock up Bradbury mountain was one of the most meaningful things that I’ve done, Joshua Barron will never be forgotten. When I when I was climbing the mountain while being around my friends and the soldiers it reminded me of my family. I’m thankful that they are still alive and that they served our country. I’m also thankful for Josh because he protected his country and it helps me keep an open mind about peers and myself. When I got to the top of Bradbury, the view reminded me of what Josh viewed everyday and how differently we see the world. He has always put himself before others, he wasn’t in the service for the title, he was there for his country and the people he loved. Some say time is what leads us, losing a family member kills us. Not to mention losing someone who spend months and years with can be devastation. Having someone so close could break us to a thousand of pieces, no one has that special place in our hearts but the ones we love and care for. I liked taking part in the Summit Project because I believe in honoring fallen soldiers. It was great meeting people along the hike and it was also an honor to carry the Maine state flag. Through the process I learned a lot about Joshua Barron and he sounded like a really good guy. This project taught me a lot, like always be thankful for what veterans do for me and our country. This experience meant a lot to me. I transported Josh’s stone in the motorcycle convoy this year for The Summit Project’s annual event. Over the 3 years I have been participating in TSP events, I have met a lot of people. I shake hands, give hugs, laugh, cry, and smile. I would see Dean and his wife at all the events. We would chat for a minute and off we go in our own direction. I didn’t know Dean from the next guy. He asked me at every event if he could hike or carry Josh’s stone. I always told him to ask Dave. It hit me last year at Twin Pines when I saw him and his wife standing in the “families” line. I thought to myself, how foolish of me. He is a family member of our fallen. At Twin Pines, I went over to Dean and his wife and hugged them tightly and thanked them. Ever since then Dean and I talk online a few times a week. We try to go to each others TSP events or show support somehow. Dean is a very giving, caring, and blessed soul. This year I carried Josh’s stone. Josh Barron, to me, is just like his Dad. As I was standing there at Twin Pines I felt his presence. My experience will never compare to anything Josh experienced but I stood in the hot sun, Tired, hungry, hot, sweaty, and I was holding his stone. It was heavy. What got me through standing in line was thinking the sunshine was the smile on Josh’s face. The smile on Dean and his wife’s face when I hand them Josh’s stone. I will stand in any element to see that smile. Thank you Josh, Dean, Sharon, Sarah, and the whole Barron family for your love, friendship, support, and your service. After carrying your son’s memorial stone for the third time, this doesn’t get any easier. Every time, I’m reminded of the world we live in and the sacrifice he made to make this a safer world. On Memorial Day weekend, I carried Joshua’s stone and stories to the summit of The Owl in Baxter State Park. Our team carried the stones and stories of 18 fallen heroes to the summit, all of which were great soldiers. The stories that were shared and the tears that were shed were our way of memorializing these fine brothers, sisters, husbands, wives, fathers, and mothers. People just like us, but living a life that put them in harms way to make sure we weren’t. Joshua’s life and stories need to be carried on, and I’m trying my best to keep his story and memories alive by telling everyone I know about him. Through getting to know you over the past year and a half, I’ve gotten to know Joshua, too. Joshua’s life is a model we should all live by: protect the ones you love, give more than you get, have fun, and live every day to its fullest. What could be any better than that? Once again, I was part of the best team in TSP history. I will say this every time I hike with TSP, and so should every member of every team. What it means to be part of TSP is life changing. The people that I’ve met are all genuine, and the Gold Star Families mean the world to me. A weekend with TSP is an emotional rollercoaster. A really good one, with hands in the air coming down the final stretch. With tears and hugs at the bottom. Back up for another run! “Josh and I had so much in common. We both loved basketball. We were both good at karate. He sounds like an awesome person and I would have loved to have met him. I know I’ll meet him in the future in heaven. This was a fun experience and I hope to carry another hero’s stone soon. PS, We even have the same name! On October 1st, 2016 I had the honor and privilege to carry the stone and story of CPL Josh Barron in Acadia National Park for an event hosted by The Summit Project. I did not know Josh but learned that Josh was a kind person who often protected others. I thought about this character trait while I traveled to and from the event. I noticed many veteran plates and military stickers on the other vehicles – more so than usual. I knew I was where I needed to be that day and it was going to be a safe journey. Hiking with 18 or so other volunteers was a lesson in teamwork and understanding. Our Fallen were too important to allow negative thoughts. As we ascended one mountain we started to learn just how difficult our trail was and we rallied together to establish a cadence that fit the team. We soon learned about each other’s lives and before we knew it we were summiting Cadillac with the American Flag waving strong. It was not a burden to carry these stones, it was a proud moment. At the summit, Team Bubble soon formed a circle to share our respective Fallen Soldier’s story. I knew Josh’s story but when it was my turn I fumbled over my words and missed the important facts about Josh. At least that’s what I thought, who knows maybe josh wouldn’t want us to drew on those facts and more enjoy life while thinking about his big smile. I knew josh was known for a good joke or prank but we I returned to camp I also learned that one of his favorite days of the year was April Fool’s day. I suddenly felt more connected to Josh because this is also my Birthday. I wondered if Josh pranked me when I tried to share his story. Maybe my fumble made others feel less pressure for when they needed to share. It was but a moment and the important thing is that I have many more opportunities to share Josh’s story! I was honored to take Joshua’s stone up to the top of Streaked Mountain. I was lucky to learn about Joshua and what he did and had sacrificed for us and our country. From what I learned about Joshua is that he was a very good man. Hearing that he had his mind set on joining the forces really made me connect with him. I as a 17 year old already have my mind set on going to the reserves and also going to a 4 year college. Hearing about Joshua’s pride for the Marine’s was inspiring to me because I want to be in the Marines as well. Joshua’s positivity about life made me not want to take life for granted. His protective nature shows just how much he cared about others and put other’s lives before his. The hike was tough at times, but knowing Joshua had pushed through harder obstacles, made me push harder to reach the top. I give all my respect to Joshua and his family for giving me the opportunity to learn about Joshua and also have the opportunity to honor him. I hope I make Joshua and his family proud that I will be joining the forces. 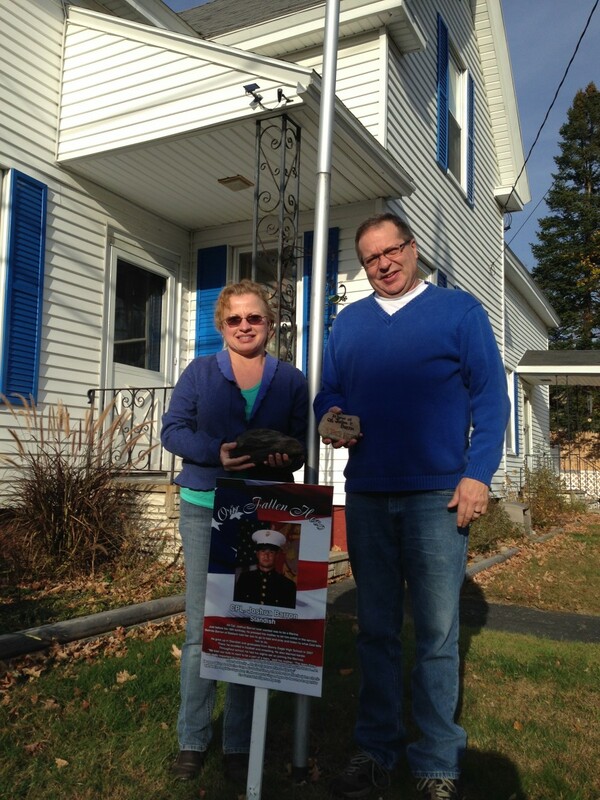 On March 26th, I had the honor of carrying USMC Cpl Joshua P. Barron’s stone to the top of Mt. Megunticook in Camden, ME with the most amazing (and thankfully, medically competent) group of friends I could have ever shared this experience with. It was during this trek that I was also able to meet the MANY different faces of Josh along the way (which I will explain later). Just days prior, the weather was NOT cooperating, and we were constantly checking to see if the snowy/icy conditions would break just enough for us to maintain course with our plans to travel two hours north on this incredible trek. Three days before this trip, on the anniversary of Cpl Barron’s death, I was fortunate enough to talk via phone with Josh’s dad, Dean. I could only imagine how difficult this must have been to share his life with me on this day, but he did and as he shared story after story of this young warrior, I came to understand him as a loving, strong, family-oriented son, husband, brother, father who grew up in the same town I live in today and attended the same schools as my children do now. Amazing that it took so long for the opportunity to come, but everything happens for a reason. When we began our ascent up Megunticook, I couldn’t believe the bluebird sky that had somehow found its way through the snow and rain that had plagued us for weeks. Felt good to be back on the trails after an EXTREMELY long winter! We decided to take a few detours along the way to include a beautiful scenic overlook where a giant white cross stood at the edge of a cliff looking down onto the town below. A hawk circled above us (which we would later note that it followed us throughout the entire trip from beginning to end) as if to be looking out for our group. This is where I met, as Dean would describe, Josh – the Protector. During the next leg of our journey, we had the great fortune of running into a woman who was pressing her way to the trailhead below after reportedly getting herself lost a few times earlier in the day. As we passed, we exchanged hellos and she asked if we were hiking with an group or organization of some sort. We began to explain about The Summit Project and its mission to honor fallen service members from Maine. And as she listened, she became more and more intrigued with every aspect of the program. And as we talked, I pulled Josh from my pack and began sharing all the stories passed to me by his father. Tears welled in her eyes and she thanked us for sharing such amazing stories. This was ABSOLUTELY the highlight of our trip – for not only did I have the privilege of carrying forth Josh’s memories on this day, but was able to provide a total stranger/instant friend with the same opportunity to carry forth his memories as well. Now Dean had told me how much Josh used to love playing pranks on his sister. With the most incredible imagination, he would spend enormous amounts of time setting traps and capturing dragons in his backyard. This being said, there may have been times when he would (accidentally? 🙂 catch his sister instead. As the ascent became steeper and I began paying more and more attention to my footing on the icy slope in front of me, I was COMPLETELY oblivious of the fallen tree which lain across my path – at head level. Greg, meet Josh – the Prankster. Enter picture, competent friends with medical backgrounds, and one head trauma doctor/”photographer” who ran up and slammed his head into the same downed tree as I did. I’m sure we all looked like the stooges running around for a minute, but there was plenty of ice to share with everybody and eventually stop the swelling. Without going into too much detail about the less eventful (but TOTALLY beautiful!) rest of our trip, we summited, celebrated, and returned to the base of the mountain with the Protector still circling above us. Starving after the 6 hour journey, and with no PB&J sandwiches to fill our bellies, we decided to take a trip to eat at a local brick oven pizza joint. FANTASTIC food and totally worth the trip! When we got there, we learned quickly that on the back of each menu was a drawing that a kid had made and given to the wait staff to be added to the collection. Most pictures were of pizza. One was of “stinky stuff” and had beautiful pictures of skunks and smelly socks and trash cans. A really artsy piece. But the entire table was taken by complete silence when Susan slid her menu over to me and I looked at the picture on the back. It was a picture of a family eating around a table – two parents and two children. One of the kids, however, was wearing a dragon costume while eating pizza with his mom, dad, and sister. I was floored. Josh was literally staring me right in the face. Now I am not one who much believes in signs, but it was impossible not to feel Josh’s presence there with us at that table on that day. It was impossible not to feel his presence there throughout this entire journey. With all my heart, this experience was more I could have ever expected and I could not ever begin to express my gratitude to the entire Barron family for allowing me the privilege of carrying forth their memories of Josh on this day. This experience will truly be one that is carried with me forever. My only wish was that it hadn’t taken so long to happen. Semper Fi, my brother. We will always miss you. I cannot express the honor and gratitude i had carrying Josh’s stone and story at Acadia national park. I may have only carried the stone for a day but I will Carry Josh’s story for the rest of my life. I never had a chance to meet Josh but as I stood there holding his stone I could feel his presence, you can feel his energy the aura that the stone gives off. It makes me want to just spend more time helping more people. I am still a firm believer that we do not pick the stone of the soldier sailor or airman I do believe that they pick us. And for some reason Josh has picked me to carry on his memory and to honor him for as long as I can to as many people as I can, and I will do this with honor. In December, my team (Team USMC) had the honor of carrying Cpl Barron’s stone during a 24 hour Spartan Endurance Race, in Iceland. This race was the first of it’s kind and within it, Spartan created a military heat. Teams from the Army, Navy, Air Force and Marines were represented by some of the finest military racers in the sport. Each team was captained by a wounded veteran and the winning team’s captain would become the 2018 Spartan Military Honor Series Sponsored Athlete. It was nothing short of a grueling race and the teams faced every weather condition imaginable. During the first lap, one of my team members fell, ultimately breaking her wrist. Another slipped shortly thereafter, ultimately tearing his ACL. Our team continued thorough the first lap, and had to brainstorm on how to continue the race. The Marine refusal to ever quit took hold and the female team member refused to stop, allowing our brother to rest his knee. After 24 hours, Team USMC came out victorious and I am honored to say, that my service dog Gunner and I are now sponsored athletes with Spartan Race Inc.
One of the secondary missions we had for the race was to honor one of our fallen brothers by carrying a stone from The Summit Project, during the entire race. Our team was beyond honored, to carry your son’s stone. We had planned to take it out during the race to reflect on why we were there and our fallen brother, but due to the harsh weather conditions, we decided to keep if safely secured in one of the rucks. After the race, all four teams came together and each team captain spoke about the stone, the fallen, and what carrying the stone meant to them. Nothing means more to me than honoring our fallen Marines. Unfortunately, while ony my second deployment, we lost three amazing Marines. During the race, I thought about them and how they are with your son now, protecting the gates of Heaven. When we were tired, hurting, and ready to give up, we thought of your son, and that stone. We pushed on. I hope one day to make it to Maine and meet your family. My journey with this foundation and Joshua’s stone began long before I knew it had. I recently left the Marines and was approached on a mountain one day and informed of this great organization and what they do to continue the legacy of our nations heroes. My girlfriend and I were talking one day about a goal to hike with every stone and how to choose certain heroes for certain hikes based on the heroes background or similarities to us. I chose Joshua first due to the nature of his service and the similarities between our lives. We chose to do two short hikes as opposed to one long hike with his stone. We traveled to Acadia National Park and hiked both Mt. Gorham and The beehive trail. I personally chose Joshua’s stone first on account that we are both Marine Corporals, having known the amount of work it takes to become a non-commissioned officer and the pride of being the most heavily relied on rank in the Marine Corps is a certain bond that not having known Joshua personally, still makes me understand we’ve walked in the same boots. Having been in the infantry due to the nature of my deployments and tasks we relied heavily on our brothers and sisters in the air wing. During the hike I reflected on what Joshua had accomplished and what his father does for so many of our nations finest. As I felt the weight on my back each thought of the courage honor and discipline Joshua had and all his father continues to do made the weight a little lighter and lighter, and by the time we reached the summit I felt as if I had a conversation in my head with an old friend. I am very grateful for the opportunity to carry Joshua’s stone and contribute to his legacy. I see his love for his family his fellow man and woman and his country. Hearing of the stones before a school outing club trip to Mt. Katahdin, I didn’t know what to expect. Most of us (most because we had a limited number of stones) were given a stone, and i received Joshua’s. I carried that stone as i could manage from being out sick for three days earlier in the week. I had to stop, but the stone was carried on to the summit thanks to a group member. Though my time was short I was proud to even carry the stone. as i later said “If they are bending over backwards for their country, than we can do the same carrying their reference a little bit of everywhere, at the same time trying to cure some back pain because that rock was heavy.” But may he rest in peace, and glory forever be found. My school had an outing club trip to Baxter State park, where we climbed Mt. Katahdin and most of us got a stone from the Summit Project. Learning about this program was really interesting because most of us had never heard of it prior to the trip. I think this project is a great idea to get more people knowledgable about the sacrifices that these people have made and keep the memories of these people alive. I carried Joshua’s stone to the summit of Katahdin. At points during the hike, I could feel the weight of the stone in my hiking backpack, which reminded me that it was there, and every time I felt it, I remembered why I was carrying it. I felt honored to have brought Joshua’s stone up to the summit, and I am thankful for the opportunity to be a part of this project. Thank you so much for running with my sons stone and memories. He I was a brave man who would take care of anyone and would give all to anyone who needed his protection or help. I am honored people are taking the time to get to know and honor him. Thank you for your willingness and strength . I am sorry I missed you!